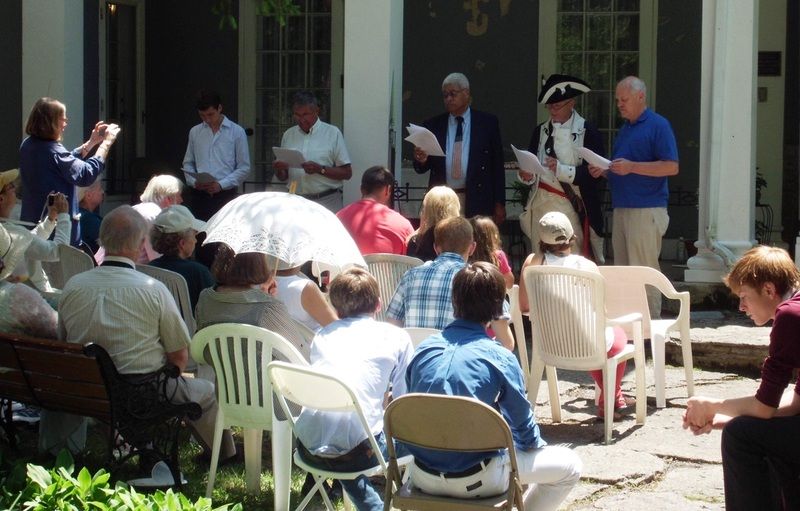 Reading the Declaration of Independence at the Boal Mansion Museum in 2014 are (from right) Christopher Lee, a descendant of the 1776 signer Richard Henry Lee, Dr. Arthur Goldschmidt, Professor Emeritus of Middle East History; and Dr. Charles Dumas, professor of the School of Theater and a nationwide television actor. Refreshments, thousands of day lilies (photo #2) and a free museum tour at 1:30 pm will be included. On Saturday, July 5, 2014, Boalsburg will bring the Declaration of Independence to life with a dramatic reading at the Boal Mansion Museum by community leaders to celebrate the community’s special tie to the Declaration. Richard Henry Lee, who signed the Declaration of Independence in 1776, is an ancestor of the Boal family and his portrait and original signature will be on display during the afternoon. In June 1776, Lee offered the resolution for independence in Congress that became the Declaration of Independence which he then signed in July. Signer (and proposer) of the Declaration of Independence, Richard Henry Lee, an ancestor of the Boal family of Boalsburg. Reading the Declaration will be Penn State University professors Charles Dumas (Theater), Arthur Goldschmidt (Middle East Studies), and Tony Lentz (Speech Communications); State College Council member Thomas Daubert; and Christopher Lee, a descendant of Richard Henry Lee and CEO of the Boal Mansion Museum. Lee, Dumas, and Goldschmidt will also be reading the Declaration of Independence the night before at the 4thFest in State College at the Center Stage at 9 pm just before the fireworks display. For that reading they will be joined by Hannah Richardson, recent winner of the Centre Sings talent competition. After the reading, the Boal Mansion Museum is offering a free tour at 1:30 of the internationally renowned Columbus Chapel and Boal Mansion Museum where visitors can see the portrait and original signature of Boal ancestor Richard Henry Lee as well as a lock of hair of Napoleon, the Admiral’s desk of Christopher Columbus and two pieces of the True Cross of Jesus. The 40-acre Boal Estate will be a picturesque sea of orange and green with thousands of day lilies in bloom. It is the site of many community weddings and receptions. For details, visit, www.boalmuseum.com or phone (814) 466-6210.